CRKT's Bear Claw 2510ER is a professional model which has a blunt tip and serrated edge, making it perfect for seat belt removal during emergency rescues and extrication from lines or nets in the water. The blade is full-tang, taper-ground AUS 4 stainless steel with a polished finish to resist corrosion. 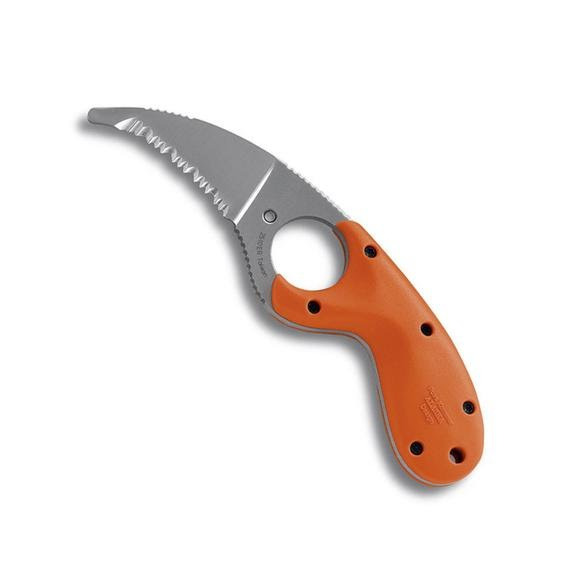 CRKT&apos;s Bear Claw 2510ER is a professional model which has a blunt tip and serrated edge, making it perfect for seat belt removal during emergency rescues and extrication from lines or nets in the water. The blade is full-tang, taper-ground AUS 4 stainless steel with a polished finish to resist corrosion. Friction grooves are placed on the blade spine, choil and near the tip for maximum blade control and safety. The contoured high visibility orange glass filled nylon handle fills the hand neatly.